recommended for: Fans of The Unquiet by Jeannine Garsee, ghost stories and hauntings, psychological thrillers, Ultraviolet by R.J. Anderson, or The Ring. As Sophie starts to piece together Nell’s last days, every lead ends in a web of lies. And the deeper Sophie digs, the more danger she’s in—because now she’s hearing the same haunting whispers. Sophie’s starting to think she’s going crazy too. Or worse, that maybe she’s not…. I wanted to love this book. I did like it, a lot, but there were a few bits that kept me from loving it. That said, I know I'm picky and if you like a good psychological thriller with some ghosts and ghouls thrown in, this is definitely your kind of book. Like Garseen's The Unquiet, West takes a girl who thinks she's going crazy--but the truth might be far worse. I was left wondering between reality and mental illness to the end, so it was a great thriller and twist. She sets up the foreshadowing well so I was constantly forcing myself not to peek ahead. I also liked Sophie a lot. She's smart and a little edgier than your typical young adult character. But like many horror leads, I also wanted to punch her several times for being stupid and impulsive. Despite that, I was really drawn into the world, the story, and the atmosphere. What kept this from being a 5 was that I thought the supernatural elements could have been developed more, and some parts of the plot felt a little contrived. Overall though, it was an enjoyable read. The plot felt pretty standard as far as young adult horror goes. You have the dead sister's secrets, the girl thinking she's going crazy, the weird happenings, the girl being stupid and running into the arms of death, the obsessive and cruel doctor. It wasn't bad by any means. Just not overly original, which is why the lowered score. I was waiting for West to do more with the Takers and other supernatural elements. Waiting for more sordid secrets about what had happened to Nell. There was also a twist that I wish had gone a different way, so I admit, I'm a little bitter that it didn't because I thought it would have been really cool. It's definitely a thrilling and compelling plot, though. Also, thank you, Ms. West, for not letting the romance overshadow the plot! Very cool concept. It's been done before, but West does it in a very different way. You have real supernatural abilities masquerading as craziness (or are they?) and underground conspiracy theories of dangerous spirits and the unlucky ones they're drawn to. The theories about the hallucinations / spirits were pretty cool, especially the soul splitting part. It was also interesting having the mental hospital turned creepy experiment center. I wish there had been more about Sophie's experiences being tortured there, because it really would have amped up the horror, but that's plot stuff. The concept was very old-school asylum horror movie and I loved it. The characters were pretty good but some of the side ones fell a little flat. I really liked Sophie. She was a nice change from the quiet, bookish types populating young adult novels these days. She was edgy, a little rebellious, and impulsive, which made me slightly forget her later horror movie-esque stupidity. I also connected with her well. Nell was also a great character, despite being dead. She came alive through her journals and Sophie's recollections. Evan was okay. I felt like he could have been developed more past the jocky sweet hero, and given some more face time. Same with Aunt Becky and mom. They were useful for characterizing Sophie's life, but could have gotten deeper treatment. West's style is good for a thriller-type horror novel of the young adult variety. She doesn't get hung up on fancy words or flowery descriptions. Instead, she lets the story doing the talking. A great example of "show, not tell." She was very good at building atmosphere. When Sophie was trekking into the creepy abandoned basement or the weird old town, I felt a building sense of dread and eeriness, which is key for a good horror novel. I only dock points because I feel that some of the dialogue was a little forced and some of the scenes a little rushed and uncut, which is a pet issue of mine. It was well-polished and the presentation was good. I liked the interspersed journal entries with the action. They were always paired appropriately and added a lot to what was going on, both by building suspense and foreshadowing some of the later surprises. 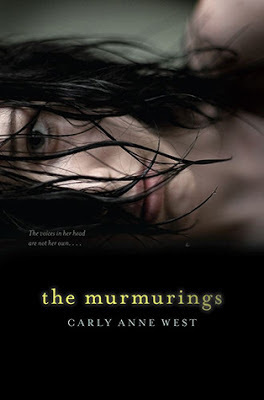 The Murmurings is an exciting young adult horror novel with psychological flair, a thrilling plot, and just a touch of romance.